Conservation and communities in Uganda have had a difficult history mirroring the struggle with colonial fortress-model conservation in other States. 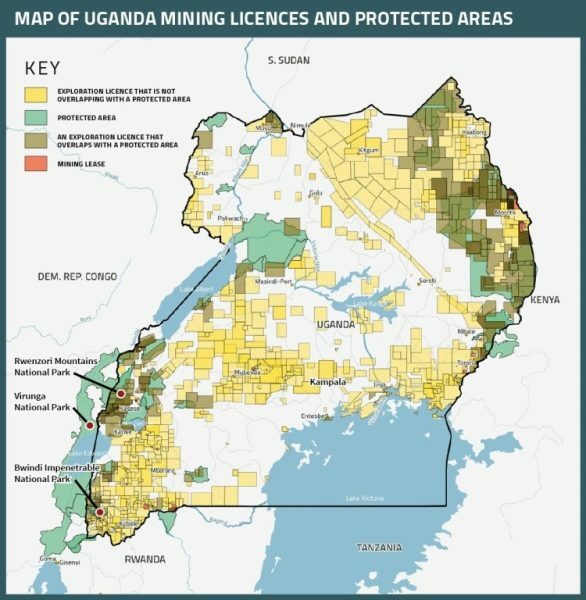 A number of protected areas were gazetted by colonial governments in 1902-1925, disregarding communal land systems or rights and responsibilities regarding natural resource governance and biocultural practices (Uganda Wildlife Authority, 2018). By the 1980s, the Uganda Wildlife Authority (UWA) realized that community-exclusion was neither popular nor effective (Uganda Wildlife Authority, 2018). Community conservation programs under UWA in communities bordering national parks have been based heavily on revenue-sharing schemes, limited resource access (e.g., water harvesting), integrated conservation and development projects (ICDPs) and human-wildlife conflict management programs (e.g., trenches, stone walls, electric fences, thorn hedges, bee hives), all of tenuous efficacy and lacking in community satisfaction. Now in 2018, as UWA is developing the second iteration of its Community Conservation Policy, communities and their territories should look beyond conventional “community” conservation and towards ICCAs – territories of life. 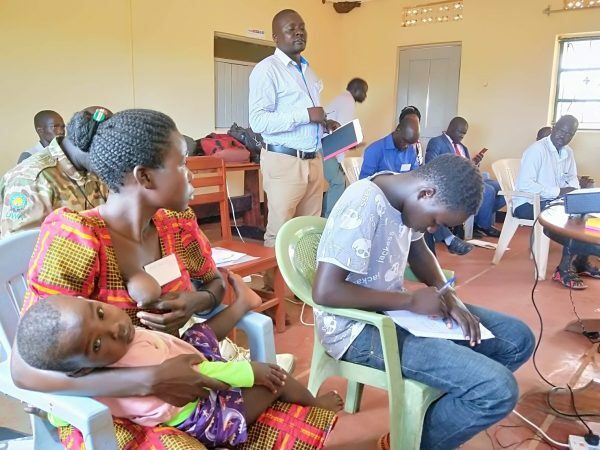 In Karamoja, situated in the north of Uganda near the borders of Kenya and South Sudan, community members have been organizing to take a more prominent role in environmental governance of the 2002 gazetted Karenga Community Wildlife Area (KCWA) (Odokorwot 2018). 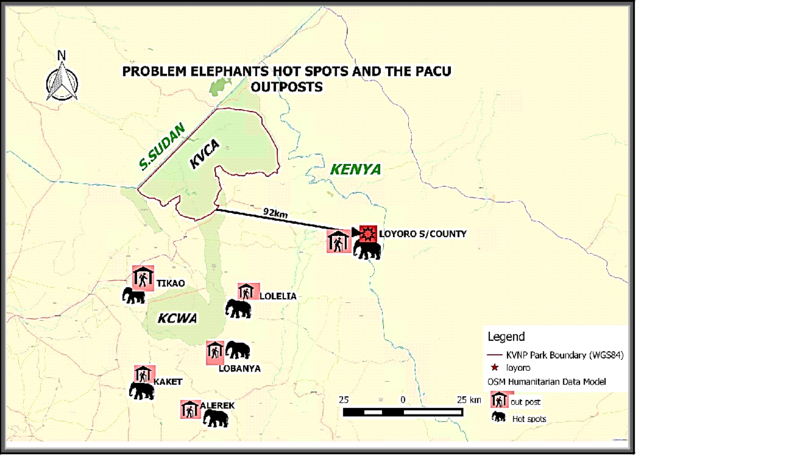 The KCWA lies at the convergence of five districts – Abim, Agago, Kaabong, Kitgum and Kotido – and borders Kidepo Valley National Park, named by CNN Travel in 2013 as the 3rd best safari destination in all of Africa (Hancock & Patel, 2016). Although it is called a “community” wildlife area, KCWA was gazetted in 2002 without consultation on the territorial bounds by communities themselves. 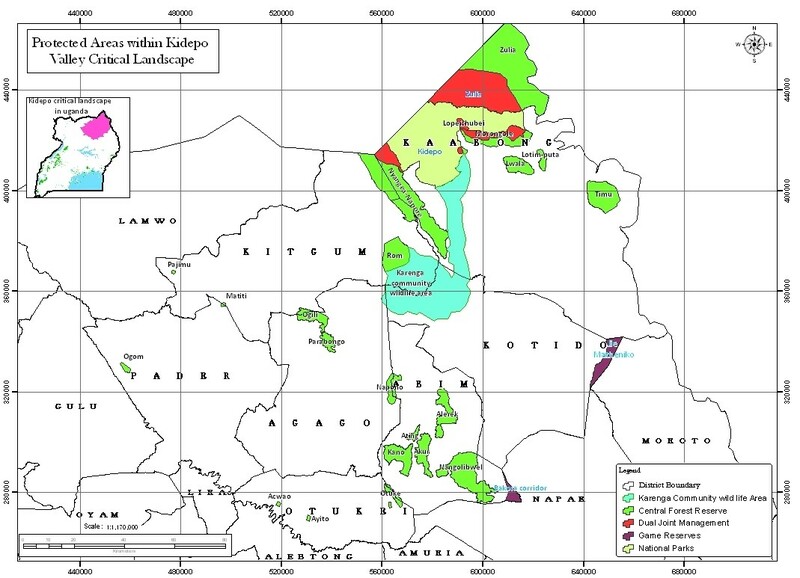 Some of the boundary limits were physically demarcated after communities had fled their villages in fear of the Lord’s Resistance Army (LRA) and although communities were aware that there was a conservation area nearby, they did not realize their homesteads were included until after post-conflict resettlement. Imposed gazettement of communal lands for conservation is perceived negatively by communities as government land-grabbing, which has fueled animosity towards the KCWA, as well as its proponents (Carmody & Taylor, 2016; Rugadya & Kamusiime, 2013; Wandera, 2018). Until the boundaries are determined by the communities themselves, KCWA is considered subject to redefinition and hereafter, when referencing the gazetted territory appears as (KCWA), but when referencing the community area is presented in quotations (“KCWA”). The “KCWA” forms an essential biological corridor for species viability and climate resilience in a global biodiversity hotspot (Eastern Afromontane) (Ayebare et al., 2013; Brooks et al., 2004). It is believed to have more wildlife than its neighboring national park (Kidepo), making it an important territory for UWA, which has authority over wildlife management whether in protected areas or not. Following decades of armed cattle rustling, civil war and heavily coercive disarmament operations, it is generally stated that peace and security have returned to the region and it is anticipated that population growth, development and private investment vis-à-vis land-grabbing will follow (Fekadu Mulugeta, 2017; Leff, 2009; Mkutu, 2008; Stites & Akabwai, 2010). In fact, post-conflict “peace” has already increased external development (including a government call to augment mining and settled livelihoods as opposed to pastoralism), resulting in some of the first fenced private lands in a region that has always had communal land ownership with family/clan plots within. Historically, the “KCWA” was perceived as a “no man’s land” free from human settlement and cultivation and primarily serving as a communal hunting ground and inter-tribal raiding corridor for Acholi, Labwor and Karamojong ethnic groups (Odokorwot, 2018, p. 2). The communities traditionally mixed pastoralism with agriculture as a resilience strategy. After forced disarmament, livestock numbers plummeted and communities focused more on agriculture, making them more vulnerable to long droughts and crop-raiding (Cullis, 2018). In 2015, UWA negotiated a trophy hunting concession for the KCWA that allocates only 3% of the revenues to communities to try and off-set crop-raiding losses. UWA also began to organize community members under a community wildlife association, now known as KAKKA (named for the 5 districts), in order to manage human-wildlife conflicts through a network of community wildlife scouts and revenue distribution from park entry fees and trophy hunting. KAKKA is now developing an organizational structure that includes representatives at the village, parish, sub-county and district levels and has been participating in study visits to conservancies and other community-based projects to pick ideas that they can apply in their own territory. In November 2018, ICCA Consortium Honorary Member Elaine (Lan Yin) Hsiao facilitated a 2-day workshop with KAKKA leaders to identify their priority challenges, objectives and actions. The three areas that emerged are: (1) harmonious co-existence between communities and wildlife, (2) improved and sustainable livelihood options for socio-economic community development, and (3) a community wildlife association that represents community interests and is sustainably managing the “KCWA”. It also acknowledged that its goals go beyond conservancy or revenue-sharing programs for KCWA communities and are more aligned with ICCAs – territories of life. Dissatisfied with the current trophy hunting arrangement, KAKKA members felt that the ICCA Consortium’s recent Policy Brief on “Inclusive Conservation” better reflected their own vision of environmental governance in the “KCWA”. The “KCWA” could help to demonstrate the potential for ICCAs – territories of life in Uganda, setting an example for other community conservation areas throughout the country and KAKKA may become the ICCA Consortium’s first Uganda member, setting a trend for a growing Consortium presence. In this process, KAKKA is having a debate on its governance structure as a legal entity, and any advice or examples on this are very welcome. This is happening at a critical time in the history of communities and conservation in Uganda and may help to shape the trajectory for generations to come. Furthermore, anyone interested in participating in the work on ICCAs in Uganda should feel free to contact Elaine (Lan Yin) Hsiao, author of this article.